Caroline had been treated for a stomach ulcer for many years, occasionally suffering from terrible pains and then suffering bouts of nausea. It all came to a head that Thursday; Caroline had severe pains all day and was unable to sleep. Gary took her to the out of hours doctor who then referred her to the QE2 hospital in Welwyn Garden City, where she received morphine and was sent home. After a sleepless night of being violently ill, she returned to the doctor the next morning, who then referred her back to the hospital. She was finally admitted to hospital not knowing that she was to spend the next two weeks in there, including her 47th birthday three days after being admitted. Caroline says “I felt like a fraud, as between bouts of pains and nausea, I felt fine”. During her first week in the hospital she underwent test after test, CT scans and what felt like every blood test known to man. It was in the afternoon of Wednesday, 14th January that the Consultant informed her that she had a suspected malignant lymphoma and needed to undergo surgery. On the night before her operation on Friday the 16th she said “The pains all over my body were so severe, I think every lymph node had enlarged. I really thought I was going to die”. She had nurses writing letters to her family as she feared that she would not make it through the ordeal. During surgery they removed the tumour, surrounding tissue and part of her intestine. A week later Caroline received the news that she had been dreading; it was what they had suspected and further tests showed the cancer had also spread to her bone marrow and chest. All this came as a blow to Caroline and her family, as she was self employed falling sick meant she would be unable to earn money to help support the family. 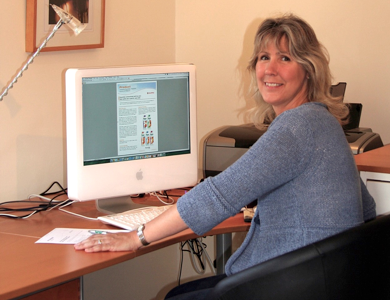 Caroline along with her husband Gary have run a graphic design business – Edmonds and Hunt Advertising in the Hertford area for over twenty eight years. They have one son, Sam who is currently busy with his GGSEs. Caroline is an active member of her son’s school PTA, Friends of Sele School. She attended every possible meeting and helped out at the various fundraising events. She is also a Councillor for Bengeo Parish Council. If this was not enough of a shock for the Edmonds to deal with, they also tragically lost Gary’s father the day after Caroline came home from the hospital. The family now not only had the worry of Caroline’s health, but also had to sort out the logistics that come with a bereavement. On 1st April she started her first of eight sessions of chemotherapy. One every three weeks for a whole day. One of Caroline’s side effects was hair thinning; fortunately she didn’t lose it all. She was also put on steroids. “During the first week after each session of chemo I had to take 24 tablets a day, gradually reducing until the next session where it all started again” she said. The course of chemotherapy finished on August 28th and a month later she was told it had been successful. The doctors said if she could get through the next year and it returned they would put her on the same chemo therapy treatment again. This form of cancer is not curable, but is controllable. Should the cancer return before September 2010 she would have to undergo a far more aggressive treatment. Throughout the pain and stress of being diagnosed and treated for Follicular Non Hodgkin’s Lymphoma, she tried to carry on as normal as possible but to make matters worse as Caroline was recovering and finally able to return to her business full time, the recession hit. Suddenly after being in business for so long and never having to look for work, she has had to look at reinventing the way she does business. The first thing she did was join the world of social media and online marketing. She designed a web page, started using Twitter and created a Facebook page. She recently also started blogging. “Times are tough out there for graphic designers, but you have to look at what is trending, embrace it and move with the times” she said. Caroline is an example to us all and is proof that even if you are dealt a bad hand, it doesn’t mean that you have to lose the game. ← I Did It! So Can you! Give Up Smoking!